Attaching media file to your toot. An action to share a toot with your followers (called a “Retweet” in Twitter). 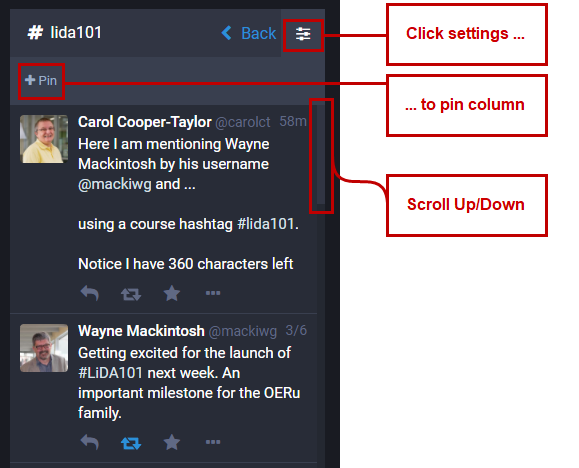 A user generated keyword prefixed with the hash or pound sign (“#”) without any spaces, for example “#LiDA101”. 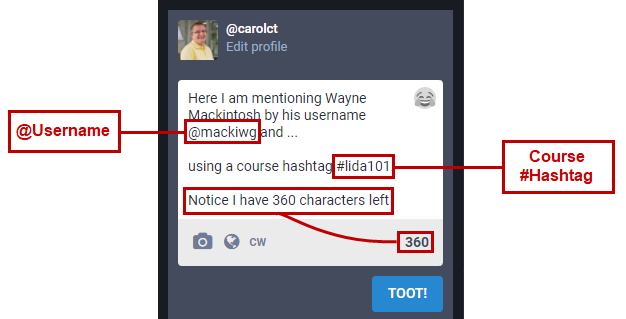 Hashtags help with searching for toots that contain the keyword tag. It OERu we recommend that you tag toots using the course code. Instance is the location of the Mastodon community you join. 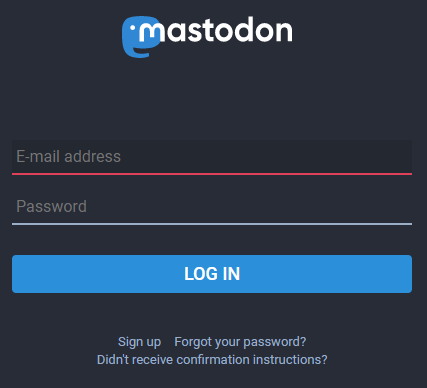 Mastodon is a federated technology with the ability to connect with multiple instances. 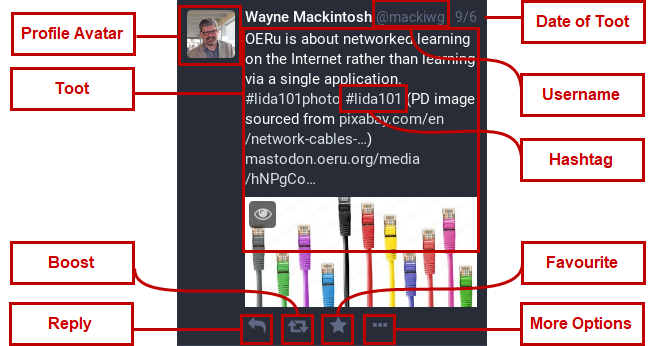 You will find the OERu instance at mastodon.oeru.org. An action to “like” another user’s toot by clicking the star icon underneath. It signifies that you are “listening’, agreeing or offering support to the ideas expressed in the original post. The notifications column lists boosts, favourites, mentions and who has followed you. An action to reply to a user’s post which includes the @username of the original poster and displays the reply as a “thread” in the context of the original post. Refers to a message posted on Mastodon (in Twitter, messages are called a “tweets”). 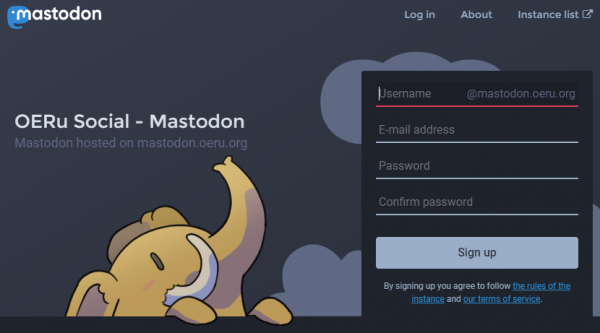 To create a Mastodon account go to the OERu’s Mastodon instance at mastodon.oeru.org. Enter a username, email address and password. You are asked to reenter your password to ensure you entered it correctly. An email will be sent to the email address you entered. (Check your spam folder if you don’t receive the email in your inbox). In the email you will find a link to confirm your email address. Once this is done you are all set to login. Click the Log in link at the top of the mastodon.oeru.org web page. Enter your email and password and click “LOG IN”. If you forget your password in the future you can see there is a Forgot your password? link. After creating your account, you should set up your “display” name and upload a profile “avatar” image. If you don’t upload an avatar image, your toots tagged with the course code will not display properly in the course feed. The profile image will be grey and your display name will be “undefined”. Display name – We recommend using your real name. Short bio – Provide a short description about yourself. Avatar – Click on “Browse” and upload your personal image (Will be resized to 120 x 120px. Remember to click on the “Save changes” button at the bottom of your screen. To make a text post, known as a Toot, enter the message you want to post in the “What is on your mind?” text box in the Compose column and click “TOOT”. You are limited to 500 characters per toot, but if you need to Toot more than this you can reply to your own toots so they will appear like a conversation. You can see the character countdown as you type. Often in courses you will be asked to include a hashtag on your Toots. Simply add the tag in the body of the message e.g. #lida101 . Note that hashtags begin with a “#”, can only contain letters and numbers, and must contain at least one letter. Don’t use spaces, an “&” or any punctuation because this will break your hashtag. When you mention someone in a Toot by using their @username they will receive a notification. These appear as desktop notifications (if their web browser supports this and has been enabled) as well as in the “Notifications” column. To post an image in your Toot, click the “Add media” icon in your Compose column and select a file to upload. You can also drag and drop your image from your desktop into the text box of your Compose column. Please note, the maximum file size is 2MB. 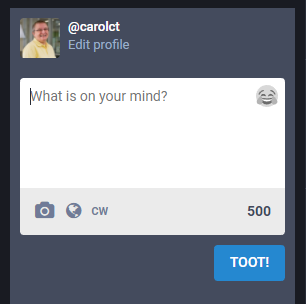 As you use Mastodon you will find that there are lots of Toots coming through. All of these will not relate to your course. The easiest way to “filter” Toots so you can concentrate on the ones you want is to do a search. The search box is found about the new Toot box. You can only search for #hashtags and @usernames. You cannot search for plain text contained within Toots. If you enter plain text, search will only return any #hashtags or @usernames that natch the search text. The search below shows a search for the course tag #lida101. Notice how search finds all the tags that begin #lida101. Click on the result you want to see all the Toots with that #hashtag in a new #hashtag search column on the right. When you have a #hashtag search open, it will automatically update with new toots. 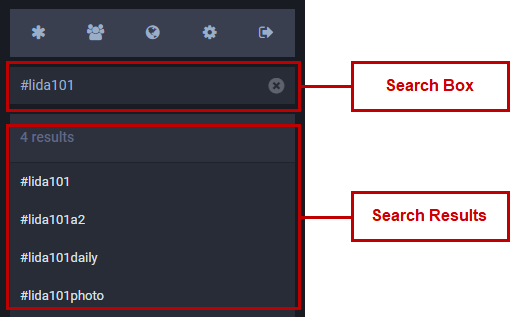 You can pin the column to keep the search open by clicking the settings symbol at the top right of the #hashtag search column and clicking “pin”. If you open that menu again you can move the pinned hashtag column to the left or right, or you can unpin it. It’s a good idea to search for and pin your course #hashtag for easy reference in the future. Use the scroll bar to scroll up and down through the Toots in the column.